Terry D. Campbell 1958-2010 March 27, 2010 YOUNGSTOWN - Terry David Campbell, 51, passed away Monday, March 22, 2010, in Cozumel, Mexico. Terry was born Oct. 3, 1958, in Youngtown, a son of Mary Poland Campbell of Struthers and the late Franklin L. Campbell. He was a graduate of The Rayen School class of 1977 and served in the U.S. Army. Terry was employed as a supervisor with Boak and Sons Inc. in Youngstown. He was loved and respected by all who knew him. He enjoyed living life, but the joys of his life were his children and his granddaughter. Terry belonged to several bowling leagues in Youngstown and Austintown, and was an avid Pittsburgh Steelers and NASCAR fan. He also enjoyed playing golf, and traveling with his devoted wife, Tammy. 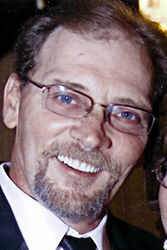 Besides his mother of Struthers, Terry is survived by his wife, the former Tammy Dutting, whom he married March 22, 1980; one son, Terry John "T.J." and his wife, Kelly (Melvin) Campbell of Vienna; one granddaughter, Taylor Warmouth; one daughter, Trista Campbell and her fiance, Jared Orr of Youngstown; four brothers, Frank (Rosalie) of Youngstown, Grover (Mary) of Mercer, Pa., Steve (Dru) of Austintown and Michael of Hubbard; and four sisters, Alice (Donald) White of Liberty, Edna Engstrom of Struthers, Jody Lynn Seabolt of Youngstown and Andrea Hover and her fiance, Chuck Tarantino of Youngstown. Terry also leaves his father and mother-in-law, John and Marna Dutting of Girard; three sisters-in-law, Theresa (Dave) Munnell of Gustavus, Tracy (David) Kane of Vienna and Toni (Charles) Jenkins of North Jackson; and one brother-in-law, John (Amanda) Dutting of Girard, as well as many adoring nieces and nephews, his Boak and Sons family, and his most faithful pet dog, Sheba. Family and friends may call from 11:30 a.m. to 3:30 p.m. Sunday at the Lane Funeral Home Austintown Chapel, where services will be 3:30 p.m. Sunday. Please share your memories of Terry.